Typically known for their off-road and enduro tires, the MotoZ Tractionator Adventure Tire is an on-road, DOT compliant tire for the adventure rider that still spends plenty of time riding on dirt. 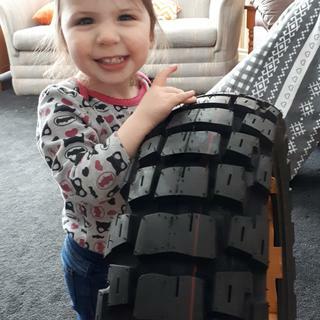 With its design that sports an exceptionally strong carcass, tread blocks that are deeper than most other options, and a specialized compound that extends durability on harsh terrain, the Tractionator Adventure is a tire that handles dirt and asphalt equally well. Riders report the tire having very good manners on tarmac during longer road trips, and excellent traction off road—even on steep inclines, wet mud, and loose gravel. Special compound designed to withstand the harshest conditions found in Australia, USA, Baja, South America, South Africa, Israel, Spain, Morocco, etc. 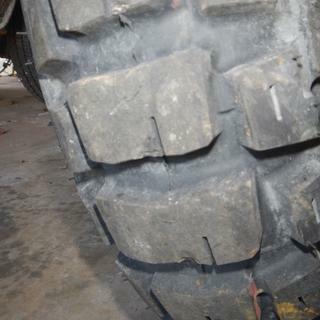 This tire lasted about 2000 miles - about 70% offroad. It has amazing versatility on all surfaces, but I wish it lasted longer. Not install yet but i heard a lot off good comentary on it. Still winter out her and à lot off Snow. Bought this for a 2004 ktm 950 adventure, if your wondering, yes I’d imagine they will be as much of a pain to break the bead as the heidenau k60 scout, there pretty stiff. My bike has the notorious “impossible to break bead”. They are a pretty hard compound and you will feel them slipping a bit when you put the power to them only when brand new, to much power coming out of a turn when brand new and you’ll be slipping, pretty fun, seriously ! If that’s not your thing put some miles on them and they hook up very well in the turns for what they are. If you have a early 2004 KTM adventure with the crazy bead it will take 80 psi plus lubed to seat the bead. Last trip typical KTM 690 tire didn’t even last the whole trip, this tire performed as well or better, and I’ll bet I get two more trips out of it, so for the money this is going to be a better tire, if no other reason than I won’t have to change tires near as often. Excellent tire, wears better than the Michelin tk 80’s that came on my ktm1090. And they handle better on and off road. I have not ridden this in the rain, and I only have about 300 miles on them, but WHOA. I am truly impressed with these tires. They grip slab well, and on the rocky terrain they don't spin easily even with my KTM 640. The only thing I can say is that the front turns in kind of weird. It's like a worn out tire that gets to the rounded edge and just drops all of a sudden. Not scary, but weird. Buy a set and you'll be happy. Just changed from stock tires, I really only have about 50 miles on these tires. Obviously I don't have a lot of miles on the tire, which is preventing me from speaking about longevity. However, I will say that the side walls are very stiff and it was a bit of a pain mounting the rear tire. As far as driving, the bike is completely different. I have much more control driving on the gravel, as opposed to before. I am not a motorcycle expert by any means and this is my first bike. The front tire was not in stock when I purchased the rear, so I purchased the MOTOZ GPS for the front tire. Thus far I am thrilled with the combination. I would highly recommend this tire if you are planning on doing much off road driving. Otherwise, stick with a more street oriented tire. I drive about 50/50 and love the tires. The grip just fine and the front tire has not washed out on the loose gravel at all. Currently have just less than half of the tread left. Granted, I don't romp the bike much on pavement but, I do ride it pretty hard off road on gravel, mud, loam and dirt. I am not experiencing any hardening of the rubber compound to date. Just a slight increase in noise from stock. Corners great with no "shoulder bobble" on tight pavement turns. I am sticking with this tire until they quit making it. I ride out of San Diego and bought both front and rear Tractionator's. I would rate these tires 5 stars off road but only gave it a 3 stars on the road, noisy, bumpy and scary at higher speeds 90 mph +. My next set will be the GPS due to losing the front end on the pavement returning from Mexico, hit some oil in the road on a turn and went down hard. Good news is that I road my 1190R home will ride again soon. The 1190R is a heavy bike and needs all the traction you can possibly give it. The difference was night and day from the Karoo3 it replaced. To be fair, the Karoo needed to be replaced. I am very happy so far. The Tractionator lets you know you have some tread back there when at freeway speeds, no funny business though, just louder than the Karoo. I'll take that for the offload performance every day of the week. It's brand new so I can't really talk to tread life and I live in arizona so I may never get to talk about wet traction but the sandy silty slick stuff we have out is no obstacle for the tractionator. It works great for that stuff. Now to find a front tire that can stand up to a 500lb dirt bike. The karoo is less than stellar at that task. Hey Rocky Mountain, where's my KTM in the selection below? 1190R if you were curious. Best on and off road mixed use tire I've seen. Hard dirt, loose dirt, gravel, some mud, 1500 miles of pavement at a stretch...it does it all. I got about 4k miles of hard use out of mine and would have gone another thousand on the street if I didn't get a good deal on another tire set. If you need a true dual sport tire, this is it. Ive run several of these now on 950 KTMs. The tire has fantastic traction an off road. Great performance and grip with a very confidence inspiring feel in the twisties. My first one had the exact same chunking problem that some people have complained about however they made an easy 1500 mile trip with no issues other than the initial chunking. Thrashing them on gravel and pavement doesn't seem to be a problem. I've not had a problem with the tires since that initial one. Good so far, except they catch groves in the road. I now have about 200 miles on these tires. Traction is great, fitment was easy and it looks like they will perform off road as well as you’d expect. I’ve only done freeway commuting miles so far. The one thing I don’t like about them so far is they catch the groves in the road, kinda bad. Rain cut groves, or seams in the road really unsettle the bike (2016 Africa Twin). I’m coming from TKC-80’s which I had none of these issues. I’m sure I’ll get used to it and maybe with time they will get better. This isn’t a big enough issue that I’ll try to return them, but if I was deciding today, I wouldn’t buy these again. Makes sad as they have so many great reviews and now I’ll have them for at least another 9 months or so. Confident on the road and in loose rocky off-road. 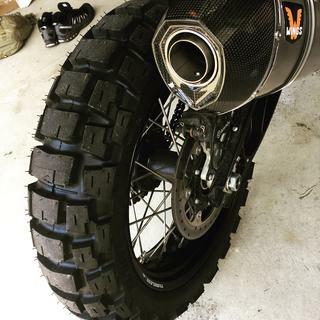 My KTM 950 Super Enduro literally eats rear tires. The Motoz Adventure has held up 3 times as long as any other tire I've had on the bike with no noticeable loss of traction. Purchased tire in spring of 2016. Never had any "chunking" off tire. Ride lots of gravel and 2 track. 150/70/18 on Ktm 950. Do my share of tire spinning off trail. Have about 3000 miles on tire. 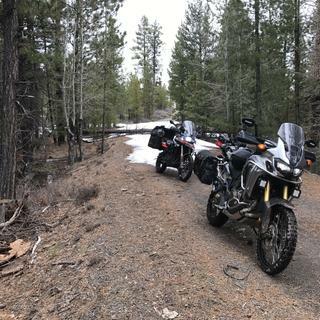 I did 500 miles this weekend in Oregon. 80% pavement, 20% dirt. Rode up from Redding. This tire worked awesome! No chunking like other posts have said. I will buy again. I haven't tried the front tire yet. Don't know if I will going by reviews. I'm on a KTM 990 Adventure. This tire works so much better than the 908RR that was on my bike. Burned through the stock TKC-80's and put on a set of the Tractionators. Durability and handling have been great. Highly recommend them. Not too favorably impressed with this tire. Missing pieces of every middle island after 258 miles of gravel and dirt roads. Expected way better performance at this price level. Handling is good and traction in dirt is very good. 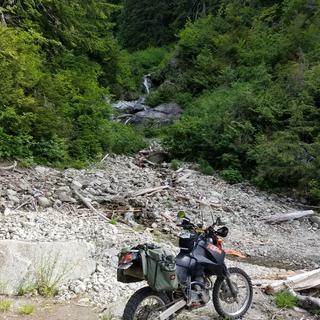 I was looking all over for an off road capable tire for my Africa Twin which would give me the traction and safety level of grip off road yet perform on road quietly and smoothly while giving reasonable mileage as well. Probley only 15% of my riding will be off the tarmac, but when I'm there I want a tires up to the job! These are GREAT! Very confidence inspiring, good looking, and quiet! The Speed range is T 118 mph. I will post an update after I've mounted the tire. Installed on a ktm 950 and used on 50% asphalt and 50% dirt/rocks/gravel. I have a KTM 990. How does a 140 rear tire compare to a 150? 150 Tractionators back ordered everywhere. BEST ANSWER: I cannot speak to the Tractionator in relation to how the 140 looks and performs on the 990. But when I bought my 990, the preview owner had installed a 140 Heidenau Scout. It looked stretched and very square. It did not handle poorly, but not as well as with a 150 size TKC or Tractionator. I think the answer to your question is that it technically can be done, but shouldn't. Also, with a bike this big and traction no where near the amount of power to the rear wheel, you will want the extra width I believe, at least off road. I cannot speak to this tire in particular.... a friend of mine and I both bought the Heidenau Scout K60 for our KTM Adventure bikes. I bought the 140, he bought the 150, his is still going strong, mine had to be replaced at roughly 4K miles. On that particular tire the tread patter from the 40 to the 50 was much different, much larger center tread on the 50 which enables it to go much longer. I will be hesitant to ever put a 140 on my rear after the Heidenau experiment. My only issue with the rear tire is that in less then 100 miles, the center lug started to chunk off. I contacted RMATV 2 Wells ago and they have not responded to my concerns. The tires rides well and has good traction on my 2012 BMW 650. I bought a thought if the line tire with the hopes of better response and more durability, I'll have to watch the rear tire and past later. my friend has a 990 and he got the 140 it is taller than the 150 , but these tires are really good. I got 5-6000 out of my last one. I was using the 908RR dunlop before, and maybe got 2000 miles. I feel i am getting a bit better hook up also! But i do like to twist the throttle coming out of the corners! Hi Rick, the Tractionator Adventure 140/80-18 is a perfect fit for the 990. It is VERY similar to the 150/70-18. In fact, I know of several guys, myself included, using the 140 on the 1190R's. Unfortunately the factory is a little behind with the 150 production so we won't see more until mid June. 140 is taller and narrower, a bit better in the dirt for side to side steering and manuvouring. 150 is wider and a bit better on the street. Not really noticeable to most riders unless pushing harder in the dirt. Hope this helps. It's only 10mm narrower. I used to have an F800GS with a stock size of 150 width on the back. I had the same problem one time with a back ordered tire. I ran a 140 and didn't have any issues. 140 should be fine for most terrains, 150 gets an edge in deep sand only. 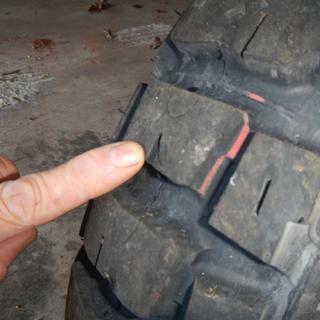 This tire shows very little wear even after 1500 miles of mixed dirt/rocks/highway. Excellent!!! I've gone back and forth between 140 Dunlop 908s and Heidenaus, to be honest I don't notice any difference due to tire size. BEST ANSWER: I used the rear for 50/50 and have successfully logged nearly 10,000 miles on it. Impressive to say the least. Strong performer on- and off-road. Predictable in all the right ways. No surprises. They handle wet and dry pavement well. Carving the corners they seem to have good traction on the pavement and they have a nice rounded profile that makes for smooth transitioning into turns . They have great traction offroad and can handle anything you throw at them. They slog right through mud and dirt. Great control on the gravel. I found that my off-road traction and improved to the point that it was pushing the front and out from under the bike in tight off-road maneuvers where normally the rear would've slipped first. Since then I've switched to a more aggressive front tire in hopes to cure that problem. I have used Shinko 804 Kenda BB and Continental tkc80 rear tires on my bike and I believe this out performs all of those in one way or another. They are true 50/50 tires with excellent traction both on and off road. These tires have excellent wear and grip like no other tire. I have used many tires over the years TKC's, Heindendau, Shinko's etc and these are by far the best tire I have ever used on my KTM 990 Adveture. They roll smoothly, handle corners like a street tire and really hook up off raod. You won't go wrong with them. They are pricy but worth every penny. I would rate them at a true 50/50 tire if not biased to the off-road side. They perform well on-road for how aggressive they are. The rear does very well at both, the front tends to wander some on road due to its aggressive design. I have been happy with them. I will continue to use the rear as my next tire since it last for awhile with great grip still! I'd say 65/35 off/on, off-road is great, on road is fine, except in the rain they are a bit touchy. But these are KNOBBIES on pavement, so keep that in mind. Very stiff sidewalls, so low pressures aren't rim endangering. The rear is great, I'll buy it again. I may try a different front next time, but definitely top shelf rubber for big Adventure bikes. They are far noisier on the pavement than the Karoo3 but once you hit the dirt they are very nice. The pavement eats them up to be sure. I'll probably only get a couple thousand out of them. I am probably 70% pavement bound. 10K?? What was that on? perhaps I need to back off the throttle.. highly likely.. These are aggressive tires with deep tread blocks, that put a lot of rubber in contact with the road. They are more offroad oriented than the 50/50 tires I've seen. They seem to last longer in mixed on/offroad conditions than other offroad oriented adventure bike tires I've compared them to. They're definitely 50/50 compared to a road tire, maybe even 70/30 that have good road manners. The side lugs do a great job of keeping you moving when in deep ruts as well. The center lugs are very deep with wide spacing, so they do well in even sandy conditions. Just put 1100 miles on this tire, about 75% off road. Fantastic off road in some really nasty conditions from loose gravel to heavy rock gardens, to mud. No complaints on road either. I've not taken them off-road much, but they sure handle like crap on the pavement as compared to the TKC80's my bike came with. I suspect it's the front tire that'a the culprit. 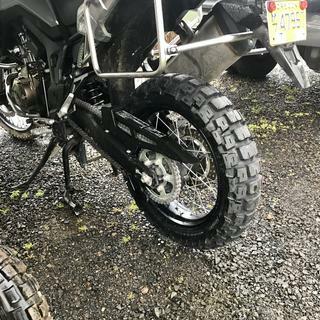 I have this tire mounted on a Ktm 990 adventure, it's extremely durable, and works really well on road despite its very aggressive design which provides excellent off-road grip. Definitely more off road, I would say 80%. Great off road on an KTM 1190, ok on the street but kinda noisy. Great mileage compared to other knobby style rear tires. Thus far it's been a great cross over 50/50 tire. Working well both on and off road. Will purchase again as replacement is needed. KTM 990. The tire is very good off road, on road is very noisy and has some (knoby) vibration. Wear at 3000 miles is at 70%. They are great for both! They may be slightly more off-road oriented but work great on pavement too. Can you run a tube in it? BEST ANSWER: I am running the Tractionator Adventure front and rear on my Africa Twin, with tubes in both. I hate flats, so even though the sidewalls are very stiff, the tubes I'm running are ultra heavy duty (4mm). I'll be replacing with the exact same setup this spring. Yes. This is my go to tire on my Africa Twin and have ran tubes in these for a couple years and no problems. Yes. I run it on my 2012 F800gs. 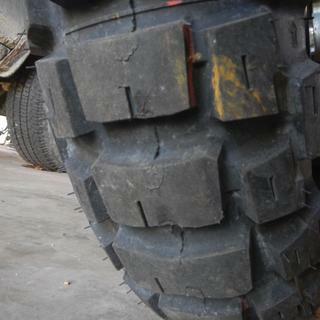 They are a decent tire, but they don't wear much longer than a TKC80. I’ve run tubes and Bib Moose in the Tractionator Adventure with excellent results. I do, run a tube. Love this tire, allows the rear end to slide the corners!! Yes. No problem running at tube if you’re not set up for tubeless. Yes, you can run a tube. Thank you! Anyone use these on a tiger 800? BEST ANSWER: Not on a Tiger, but I have them on my Africa Twin (same category of bike) and I LOVE them. Great on the road and the dirt, and so far I have around 6,000 miles on my rear and it looks just over half worn. It's not that the rubber is really hard, they just have a lot of rubber when they are new. I would thoroughly recommend them for a mid size ADV bike like the Tiger. I have only used it on my Africa Twin but owned and ride with guys who run them on their Tigers. Great off road tire with great wear compared to any other knobby on the market. On my third rear and second front. Yes, both the Tractionator Adventure and Tractionator GPS are used on the Tiger 800. 150/70B17 and 110/90-19. the diameter is the same (18"), but the width is not. 140mm wide tire = 5.5" wide, the XR-L has a 4.6" wide tire. You might fit a 130 (5.1"), but not a 140. Check out the 120/90-18 (65R) Shinko E-805 tire on this site. Also DOT approved. What is the weight of this tire?? BEST ANSWER: It weighs about 16.5 pounds.